The Pied-billed Grebe is a small, brown diving bird found in both fresh and saltwater habitats. It has the endearing habit of carrying its newly hatched young on its back. This grebe is seldom seen in flight and evades predators by either diving or simply sinking out of view. The Pied-billed Grebe has a wide distribution nesting from central Canada across the United States to Central America, the Caribbean, and large parts of South America. In winter they retreat to the central and southern United States and southward through the Americas. 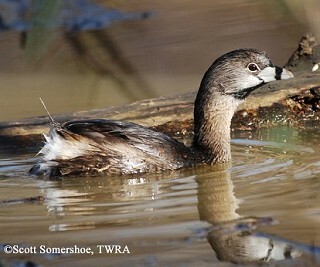 The Pied-billed Grebe nests in a few scattered locations across Tennessee, but is most common during the non-breeding season from August through April. Description: This small brown waterbird has a short neck, large head, and a tufted, whitish rump. The bill is short and thick, and the eye dark. During the breeding season (February-September) the bill is whitish with a black ring around it, and the throat is black. Males and females look alike. Other grebes are larger, have thinner bills that do not have a black band in summer, and have white patches in the wing that are visible in flight. Habitat: Migrant and wintering birds are found on lakes and large ponds with submerged aquatic vegetation. Most breeding records in Tennessee are from shallow ponds and lakes with areas of open water and emergent aquatic vegetation such as rushes, cattails, and grasses. Diet: Fish, crustaceans (especially crayfish), and aquatic insects. Nesting and reproduction: Pied-billed Grebes are known to nest in ponds as small as a half acre. Pairs begin nesting in late March and are strongly territorial. Clutch Size: 4 to 8 eggs, with an average of 7 eggs. Incubation: Both parents incubate the eggs for 23 days. The eggs are usually covered with vegetation when adults are off the nest. Fledging: Young can leave the nest within one day of hatching, but usually stay on the nest platform. Both parents feed the young and may carry them on their backs, even while swimming underwater. Soon after hatching the young are able to swim on their own. Nest: Both parents build the nest, which is a floating mass of vegetation in shallow water anchored to emergent vegetation. 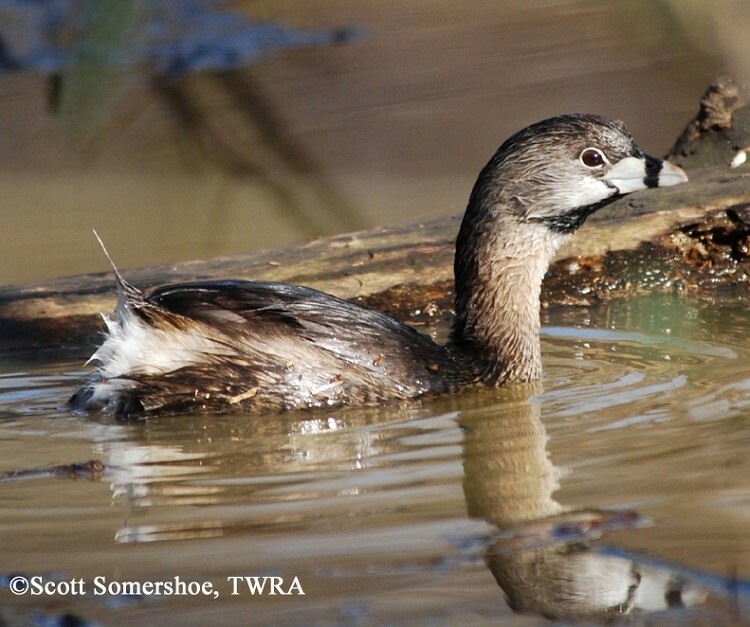 Status in Tennessee: The Pied-billed Grebe is a fairly common migrant and winter resident in large bodies of water throughout the state. During the summer they are rare, breeding in scattered locations across Tennessee. Most breeding records are from shallow ponds and lakes with open water and standing rushes, cattails, and grasses. Fall migrants and wintering individuals arrive in August and remain into May. The Pied-billed Grebe is rarely seen in flight because it migrates at night. It escapes predators by diving. Grebes do not have webbed feet like ducks and geese. Instead they have a flap of skin around each toe. Best places to see in Tennessee: Most easily seen during the winter in open bodies of water across the state. Muller, M. J., and R. W. Storer. 1999. Pied-billed Grebe (Podilymbus podiceps). In The Birds of North America, No. 410 (A. Poole and F. Gill, eds.). The Birds of North America, Inc., Philadelphia, PA.